Updated March 28, 2019 Join our Facebook group! We plan to have international folk dancing on campus about one Sunday per month. International Folk Dancing will occur on Sunday April 28, 2019. Wednesday night Israeli dancing is available at a new location off-campus, starting January 9, 2019. Jewish Community Day School, 57 Stanley Ave, Watertown. 7:30 pm partner dancing. 8 - 11 pm regular dancing. Suggested donation $2. Free for college students, children, and JCDS affiliates. Please park in the Family and Friends lot, not the small lot at the front door. For updates on Israeli dancing, please see the Facebook group or email archive. Unfortunately we were told on October 4th that the club was losing its student group status at the end of October 2018. Thanks to everyone who has provided support during this time of transition. Click to jump to a category. 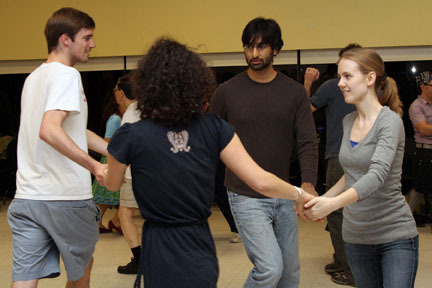 Sunday night International Folk Dancing meets one or two Sundays per month, from 8:00 to 10:30 pm, usually in classrooms at 77 Mass Ave.
September 2, 2018 Kresge Auditorium basement Kresge Rehearsal Room A Beginner's Night! September 9, 2018 Student Center 2nd Floor Lobdell Dining Hall Beginner's Night! September 16 - October 7, 2018 Student Center 2nd Floor Sala de Puerto Rico 9/16: Live music by Rakiya! October 14 & 21, 2018 Kresge Auditorium basement Kresge Rehearsal Room B 10/14: Live music by Rakiya! October 28, 2018 Student Center 2nd Floor Sala de Puerto Rico Live music by the Cambridge Folk Orchestra! The final international dance as a student group! January 13 & 27, 2019 Building 5 2nd Floor Room 5-234 IAP folk dancing. Live music by Blajini! International Folk Dancing no longer meets weekly starting November 1, 2018. We plan to have dancing about once a month. To see what dances we've done from July 2002 - October 2018, see the playlist archive. See our web archive for old versions of our web pages. Wednesday night Israeli Dancing has moved off capmus. As of January 2019, the location is the Jewish Community Day School, 57 Stanley Avenue, Watertown MA. October 31, 2018 Student Center 2nd Floor Sala de Puerto Rico The final MIT Israeli dance! November and December 2018: Wednesday night Israeli dancing is available at Kehillath Israel, 384 Harvard St, Brookline. We are unable to hold Israeli dancing at MIT starting November, 2018. Check the Israeli email announcement archive to confirm information about each week's location and teaching schedule, and special events. Light kosher snacks and drinks will be provided each week. MIT Israeli dancing was co-sponsored by MIT Hillel. For more information about Israeli dancing, email mitisraeli [at] gmail.com . In addition to our folk and contra dance PE classes, some semesters there is also an all-Israeli folk dance class run by David Karger. Register with the PE Department. For more information, email karger [at] mit.edu . International Folk and Israeli Dancing each start with Early Teaching at 8:00 pm, followed by teaching and requests. Beginners are always welcome. Admission is free for MIT and Wellesley students; an optional $1 donation is suggested from others. 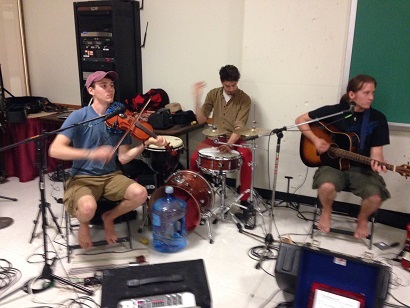 From 1998 - 2018, the Contra Dance for All, with live music, met several Tuesdays per month from 8:00 to 10:30 pm. The MITFDC gives classes and workshops as part of MIT's Independent Activities Period each January. Check out our IAP offerings for January 2019. Check back for 2020. We have 3 email lists, one for each night of dancing. These lists are for announcements only and have very low volume. or fill out this form. You will receive an e-mail requesting confirmation. 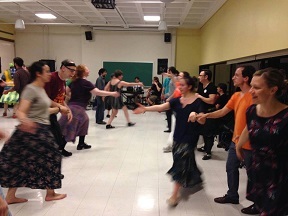 Contra Dancing (no longer active -- occasional off-campus announcements): Send a blank email to fdc-contra-dance-subscribe[at]mit[dot]edu , or fill out this form. You will receive an e-mail requesting confirmation. or fill out this form. You will receive an email requesting confirmation. If you have any questions, please contact the Folk Dance Club officers at fdc[at]mit[dot]edu. The Christmas Eve Israeli Dance Marathon takes place every year on or about Christmas Eve. We start at 6 pm and dance until about 4 am. The 2018 marathon was held on December 24. Check back for information about the 2019 marathon. Beginner's Nights are for people who haven't done much dancing before and want to learn some and for more experienced dancers who want to practice the basics. In other words, they are for everyone. You need no prior experience and you don't need a partner. Beginner's Nights for all 3 nights of dancing occur in September and January each year. 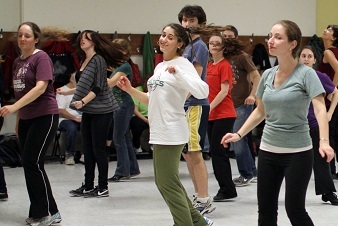 The Israel Folkdance Festival of Boston takes place each year in March, in Kresge Auditorium on the MIT campus. The next festival will be on Sunday March 22, 2020. The show includes performances by dance ensembles from far and near. Visit http://www.bostonfestival.org for more information and to order tickets. As of 2019, Sunday International Folk Dancing meets in the main classroom complex at 77 Massachusetts Avenue. To reach Building 5, go up the stone steps, enter the building, and immediately turn right. Or for an elevator, enter at street level to the left of the steps. See a schedule for the #1 bus which runs along Mass Ave.
Free parking is available in the lot behind the Bank of America ATM at Mass Ave and Vassar Street (though it sometimes fills up on weeknights), or on the street. This lot is free after 5 pm. Most parking meters near MIT require payment until 8 pm Monday-Saturday. Check the signs! Paid parking is available in the Albany Street Garage (east of Mass Ave). $9 flat rate nights and weekends, credit and debit only. Spaces should be available when the free options are full. The West Garage on Vassar Street is closed permanently. The Folk Arts Center of New England home page, including their calendar Folk Dancing 'Round Boston. BIDA (Porter Square, Cambridge) and the Jamaica Plain Gender Free Contra Dance are the other contra/traditional square dances in the city. contradancelinks.com, a comprehensive page of links to other Contra Dances around the world. The Cambridge Folk Orchestra plays at various folk dances in the Boston area, and occasionally plays at MIT at our Sunday night international folk dances. The MIT Folk Dance Club Songbook, a compilation of lyrics of the songs in our record collection. Arthur Saltzman has posted FDC photos and movies from the 1960s. 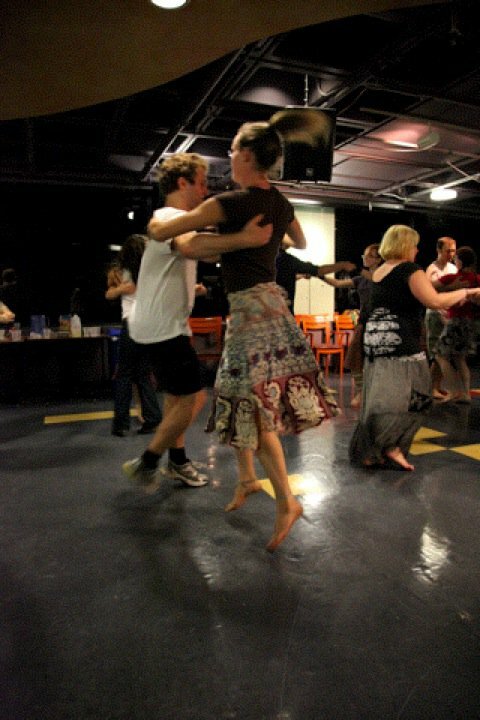 The Tuesday Night Revival is an advanced Balkan dance group that used to dance at MIT, and now holds dances about once a month in Arlington on a Friday or Saturday. Zdravets is a local Bulgarian band which hosts a dance once a month in Newton Corner (formerly in Arlington). Balkan Music Night is a concert and dance party which occurs each year in March, in Concord, MA. The Dance Gypsy is a calendar of contra and other folk dances throughout the U.S., focusing on New England. 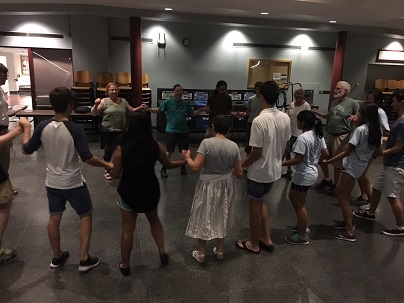 Israeli Folk Dance in Boston, including Sunday night Israeli Dancing at Temple Emeth in Chestnut Hill (formerly located at Harvard Hillel), and Monday night dancing at Congregation Kehillath Israel in Brookline. 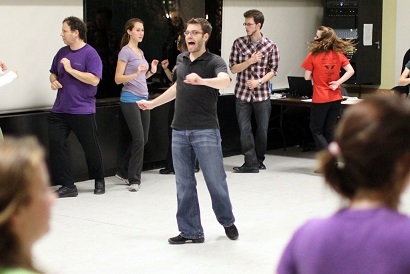 israelidance.com, which includes a test to see if you are a true folk dance addict and a session-finder, in case you're thinking of moving and want to see if there's dancing there first. Comments on this home page and other subjects are welcome. Send mail to fdc[at]mit[dot]edu .